The cinema has always been a great platform to explore the dysfunctions that dwell within family units. There is an overwhelming abundance of films dealing with family dynamics which makes it extremely difficult for new films exploring the subject to bring anything new or fresh to the platform. “Jenny’s Wedding” is one such cinematic adventure that indeed explores the secrets and the damaging truths that exist within family units. What makes it different or unique? Well, I can’t really pinpoint such a thing based on the trailer. That’s not to say that there is not a novelty at the core of the story. The lead character, Jenny, is gay and wants to marry her girlfriend. I use the term novelty because LGBT characters and LGBT issues are not new in cinema, yet I often see the use of such characters as a hook for audiences, which I don’t think is the appropriate way to address the issues. Enough about the issues however, this isn’t that kind of article! 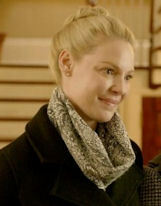 Jenny is played by Katherine Heigl and her partner Kitty is played by Alexis Bledel. Jenny’s parents are played by Tom Wilkinson and Linda Edmond. The plot is very basic. Jenny is openly gay — it’s only her parents that don’t know her truth. When Jenny decides to marry her girlfriend, who her parents thought was simply her roommate, Jenny must deal with coming out to her folks and coping with whatever reaction that produces. The trailer is very simple; however, there is a shift between Jenny’s parents that is seen, where as one parent is perhaps more accepting of Jenny than the other. Jenny, like any bride to be, wants her parents at her wedding, but the trailer insinuates that this may not be something both parents are willing to do. There is not a lot that is represented in either plot or subplot in the trailer, but I try not to underestimate a film like this because there is room for the material to be acted really well, thus conveying an emotion and a message. “Jenny’s Wedding” was written and directed by Mary Agnes Donoghue (“White Oleander,” “Veronica Guerin”) which actually sheds some light on what type of picture this will be. I personally thought “White Oleander” was a beautiful film, both visually and in the script. It is fairly obvious that Donoghue’s films feature a strong female theme and that is quite fitting for a tale of woman and her potential wife. I think there is a lot of potential in the script that will allow real acting skills to shine through. Based solely on the trailer, though, I have only one small hesitation. In the trailer, there are a few scenes shown between Heigl an Bledel, and if I am being completely honest, I don’t feel chemistry between them. It could, of course, be the way the trailer was cut and I sincerely hope so because if the two leads don’t have chemistry, then the audience will not believe that they are in love, so much so that they wish to get married. It’s scary to think that the whole film might ride on the chemistry of the leads. If that isn’t there, for me, the film will simply not work. Scheduled for a July 31 release, “Jenny’s Wedding” is rated PG-13 for thematic material which may include a crude sexual reference.